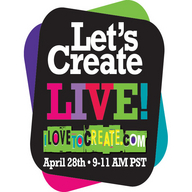 iLoveToCreate is hosting Let’s Create LIVE, an online crafting party through Ustream! Tune in April 28th from 9am to 11am (Pacific Time) for two-hours of crafty ideas, techniques and tips with six star designers using our Tulip® and Aleene's® products! Hosted by Pattie Wilkinson a.k.a. Pattiewack! We'll give away prizes, share live demos and more. Save the date and check back soon for further details!